Maybe it is because I live in the Midwest. Maybe it is because I have Irish and German roots. Maybe it is just because I love comfort food. Whatever the reason, I love this GAPS Intro Meat and Potatoes dish. Oh and it is safe for AIP and Stage One of GAPS Intro. That’s right. A Stage One meal you can eat with a fork. It’s delicious. It’s nourishing. It’s comforting. And when you are on GAPS Intro, the idea is quite exciting. So how do you eat meat and potatoes on a diet that is considered a soup only diet, where you can’t have roasted meats or starches? Simple: substitute, boil, and deconstruct. First the meat: early on in GAPS Intro all foods must be well cooked and simmered. 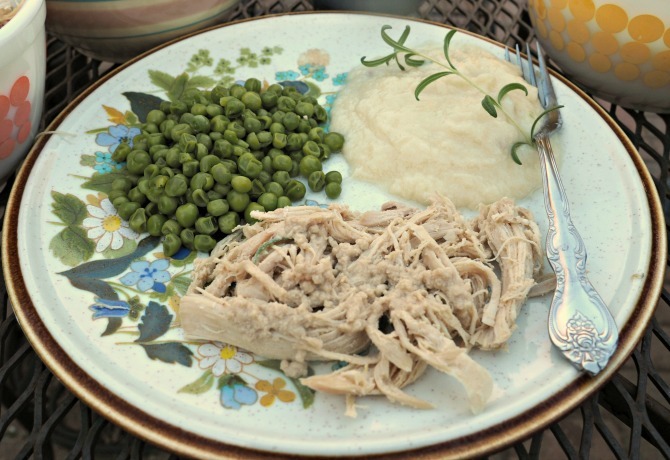 Poultry and boiled beef roast, shredded, work the best for this. I used turkey my first time around because I was craving Thanksgiving food. Simply cook as you would normally, remove from the bone, and shred. If cooking poultry, take all soft bits (skin, cartilage, giblets, etc.) and puree them in a blender with enough broth to achieve your desired consistency.. This makes a nutrient dense and healing gravy. Root vegetables make great potato substitutes – they have a very similar texture. For flavor, I find cauliflower and celeriac to be lovely options. You may also enjoy combining different vegetables for a unique blend as your potato substitute. Clean and chop your vegetables. Cover with water and bring to a boil. Simmer covered for 30 minutes or longer, until the vegetables are very soft. If Drain off the water and mash the vegetables. Add garlic, salt, tolerated seasonings, and fat to taste. Lard give the best “potato-y” flavor. Use either a potato masher or an immersion blender, depending on whether you like it slightly lumping or smooth. You can also cook the vegetables in broth for added flavor and healing power. Use less liquid. Save any broth you drain. If you wish, you can puree the broth in with the vegetables, fat, and seasoning and then simmer until desired consistency. Now that you have your meat and “potatoes,” it is time to create the meal. 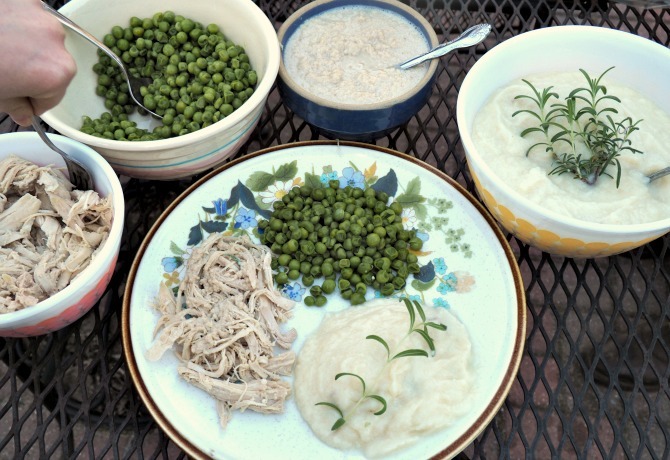 Serve up your meat, “potatoes,” and additional cooked vegetables (carrots, broccoli, peas, green beans are all good options, but note that peas and green beans are not allowed on AIP) on a plate and dig in! Just don’t forget to drink a mug of broth along the side. Yes, it is basically a deconstructed soup at this point. But who cares?! You’re on Stage One and eating with a fork. 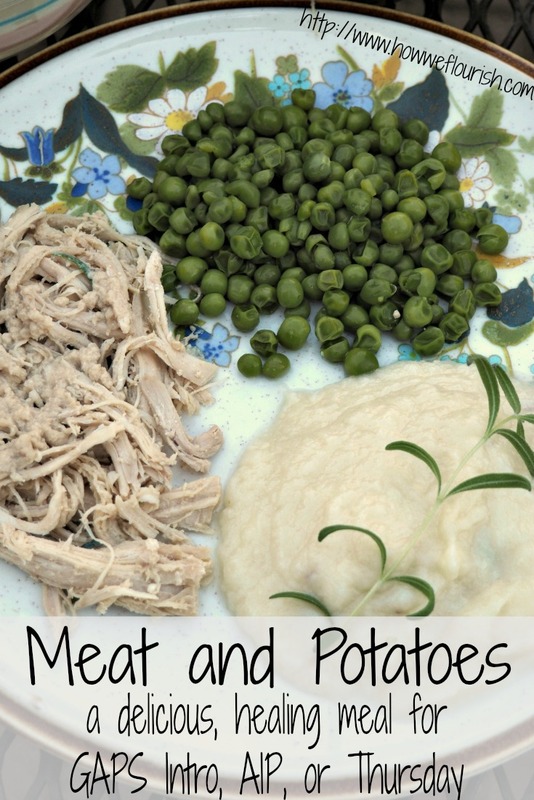 This comforting meat and potatoes recipe uses turkey and cauliflower - it is wonderfully reminiscent of Thanksgiving! Safe for healing diets, and delicious for everyone. Simmer the turkey breast covered in filtered water for 1 hour. While the turkey is cooking, clean and chop the cauliflower. Only use the florets for GAPS Intro. Simmer the cauliflower in a small amount of water or broth for 30 minutes, or until very tender. 30 minutes before dinner is to be served, start simmering the vegetables for 30 minutes. Drain any extra water (do not drain if using broth). Puree the cauliflower with the lard and garlic until smooth. These are your "potatoes." When the turkey is fully cooked, remove from the broth. Remove the skin of the turkey. Place this in a blender with a small amount of broth and small amount of salt. Puree until smooth. Use this for gravy. Shred or slice the turkey. Serve the turkey, cauliflower potatoes, and vegetables topped with gravy, salt to taste, herbs if desired (rosemary is phenomenal), and turkey broth on the side. Enjoy! Shared on AIP Recipe Roundtable, Allergy Free Wednesday, GAPS Intro Roundup, and Wildcrafting Wednesday.